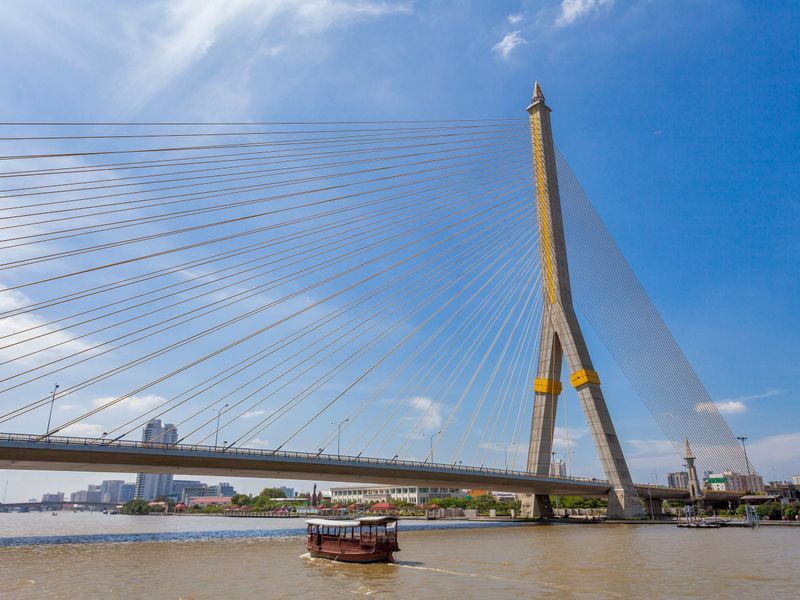 The Rama VIII Bridge or called is a suspending bridge crossing the Chao Phraya River in Bangkok, Thailand. The bridge connects the old town area (Visutkasat) with Arun Amarin area on another side of the river. The construction took around 3 years and it was eventually completed in 2002. 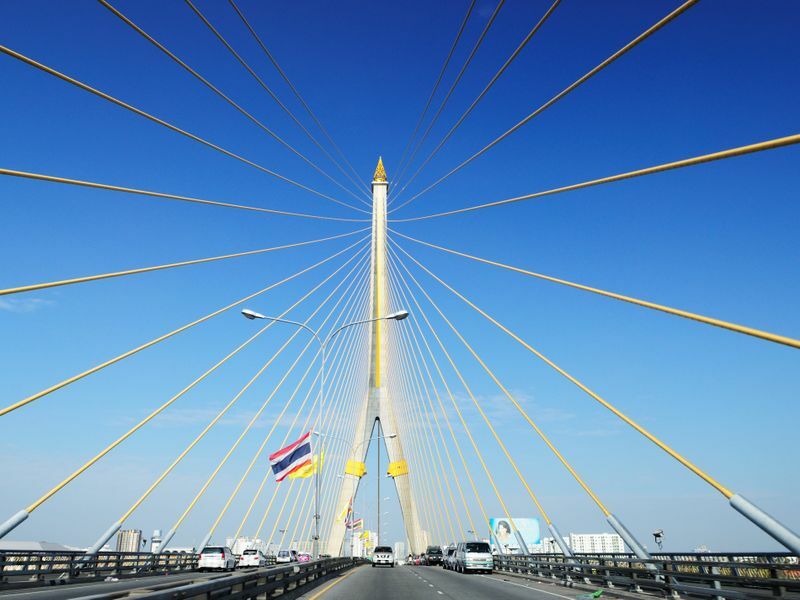 The bridge is named after the late King Anada Mahidol and was inaugurated on his birthday. The structure of the bridge is quite unique as it is asymmetrical. At the completion, it was the world's largest asymmetrical cable-stayed bridge. The bridge deck carries 2 carriageways of 2 lanes each. There are also the walkway and cyclist lane. Rama VIII bridge was built to alleviate the congestion from Pinklao Bridge which was initially connect these 2 sides of the river in the area. The pylon is topped by a shape of flame painted in gold. From the bridge, you can see the old town area of Bangkok as well as the shining Golden Mount. The bridge can easily be observed from Santi Chaiprakan Park or Phra Sumen Fort on Phra Athit Road. One of the best spot to see Sunset in the old town area. 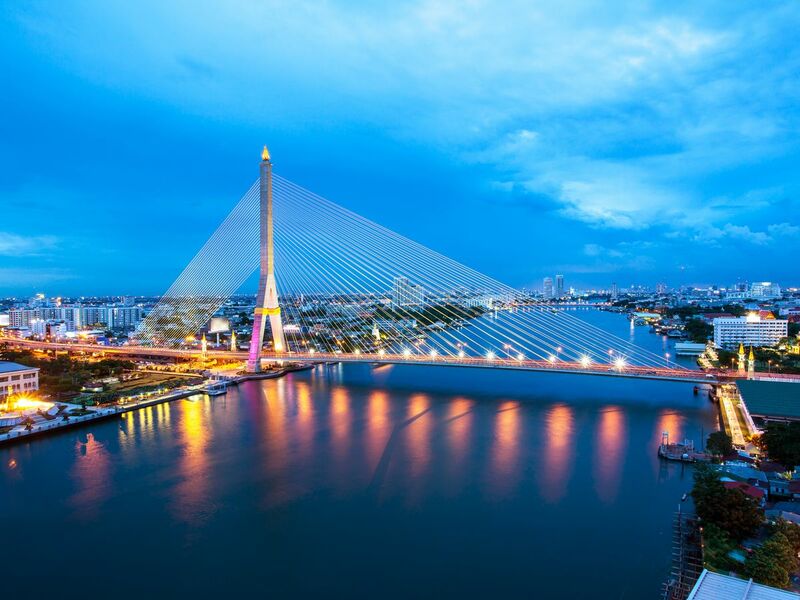 With the appropriate height of the bridge, it will allow you to see the overview of the city and the stunning Chao Phraya River. Thais don't regularly come or romanticise it too much but won't hesitate to recommend to visitors and foreign friends.